Looking for hotels near Ribeirão Mall? With city views, Apto Próx. Ribeirão Shopping - Lindo is located in Ribeirão Preto and has free WiFi. Located in Ribeirão Preto, 3.1 mi from Pinguim Beerhouse, TRYP By Wyndham Ribeirão Preto features an outdoor pool and sun terrace. Guests can enjoy the on-site restaurant. Ideali Hotel is located 984 feet from Ribeirao Municipal Market and Ribeirao Shopping Mall. Free WiFi access is available. Ibis Ribeirao Preto Shopping is set in Ribeirão Preto, 2.6 mi from Pinguim Beerhouse. Guests can enjoy the on-site bar. All rooms have a flat-screen TV with cable channels. Located in Ribeirão Preto, Transamérica Prime Ribeirão Preto features a swimming pool, a fitness center, a sauna and air-conditioned rooms. Offering a restaurant, Ibis Styles Ribeirão Preto Braz Olaia is located in Ribeirão Preto. Free WiFi and free parking are available. Offering a gym, sauna and regular and acclimatized pools with sunloungers, JP sits within Ribeirão Preto green surroundings. It features soccer, volleyball and tennis courts. The people that work at Hotel JP care about their customers! Ideally located just 2461 feet from Novo Shopping Ribeirão Preto, near the Lagoinha Industrial District and 3.7 mi from Anhanguera Highway, with easy access to the main locations of the city,... New just opened 2 months ago! Intercity quality and great price, everything was great! This contemporary hotel in Ribeirão Prêto sits behind an elegant water fountain and spacious glass-walled lobby. 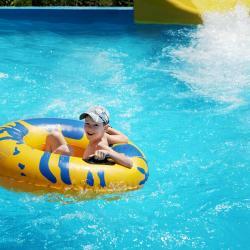 It offers a pool with a waterfall and wood-decked sun terrace, and free Wi-Fi. Very good breakfast and the rooms from the "vip" area are quite good. Located in Ribeirão Preto, 6 miles from Municipal Theater, Ecotel features a garden and shared lounge. All rooms have a flat-screen TV with cable channels and a private bathroom. Featuring a shared lounge and free WiFi, ARQ Inn Hotel is located in Ribeirão Preto. Providing a restaurant, the property also features a bar. The property is 1.2 miles from Municipal Theater. Located 1.5 miles from Municipal Theater, Hotel Canada has rooms with air conditioning in Ribeirão Preto. All rooms feature a flat-screen TV with satellite channels and a private bathroom. Located in Ribeirão Preto, Apiacás Hotel has air-conditioned rooms with free WiFi. 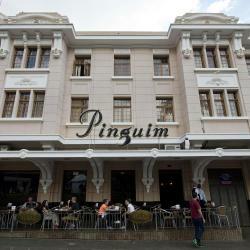 Located around 1.9 miles from Municipal Theater, the hotel is also 2.3 miles away from Pinguim Beerhouse. Hotel Cidade is located in Ribeirão Preto, just 1.1 mi from the city center. Free WiFi access is available. São Francisco Hospital and São Lucas Hospital are both within 1312 feet from this property. Wow! What a hotel! The staff is SUPER friendly and helpful. Hotel Barão is located in right at downtown Ribeirão Preto and offers practical rooms with Wi-Fi access. There is a 24-hour front desk and laundry services. The property offers free parking. In a central location, JR Hotel Ribeirão Preto is within 2297 feet from Shopping Santa Úrsula mall and the popular Pinguim Brewery. It offers breakfast, gym and parking. Parking and Wi-Fi are free. Located in Ribeirão Preto, Garden Hotel RP offers an outdoor pool, a fitness center and a sauna. A business center is available for use and WiFi is free. Boasting scenic city views from the rooftop pool, Bassano Vaccarini sits in Ribeirão Preto center. It features a modern gym, air-conditioned apartments and a cybercafé. Hotels with great access to Ribeirão Mall! Boasting a rooftop pool with panoramic deck, Taiwan Hotel is located in Ribeirão Preto center, 3 blocks from Santa Úrsula Shopping Mall. It provides a restaurant, gym and free parking. Very central location close to restaurants and bars yet distant enough you hear no noise. Located in the heart of Ribeirão Preto, this hotel is just 3 blocks from 15 de Novembre Square. It has a pool, massage services, a sauna and free WiFi with high speed internet access. Location and staff were very pleasant . Great breakfast. Very good WIFI. Located only 1640 feet from Pinguim Beerhouse, Hostel Ribeirão is located in Ribeirão Preto and features rooms with free WiFi. Just off SP-330 and neighboring Novo Shopping, Golden Park Hotel offers modern rooms with free wired internet. It has an outdoor swimming pool area and an onsite restaurant. Internet, clean of room and facilities, clerck education. Just 5 minutes by car from Cravinhos’ bus station and city center, Ônix Inn features a 24-hour reception, buffet breakfast and free Wi-Fi. Room service is arranged. Located 984 feet from Avenida de 9 Julio, Comfort Inn has an outdoor pool and sun terrace. It offers rooms with free wired internet and large windows viewing Ribeirão Preto.